A new local news set excites producers, anchors and news managers. It may even intrigue the audience, the hoped-for result. For the last thirty years, set redesigns have tended toward the shiny and the space-age, and rarely produce anything truly eye-opening. 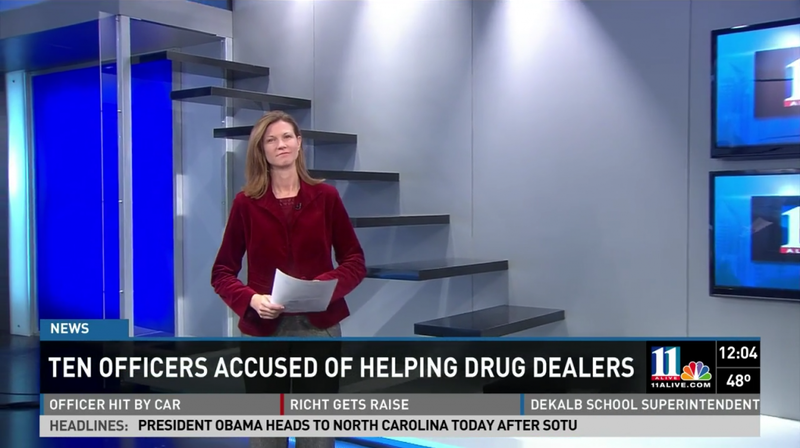 Last week’s debut of WXIA’s new set was the exception. It has The Staircase. The Staircase isn’t exactly the centerpiece of the new set. The set is a 360 degree ice-blue design that absorbs the entirety of the station’s modest studio, encroaching into the newsroom and making all of us random players in the mise-en-scene of the nightly news. Over my desk, toward Cleveland: The old set. The Staircase is the oddity. As the new set took shape, a balcony appeared. The previous set also had a balcony, but no way to get to it. For this balcony, a staircase appeared. The staircase was suspect from the get-go. The steps stuck out of the wall, with no structure undergirding it. There was no handrail, giving it an edgy, hint-of-danger look. 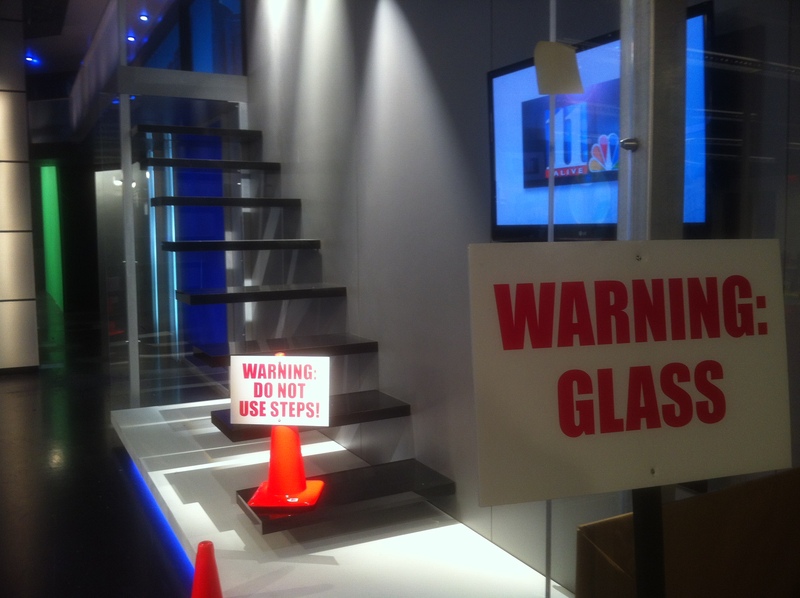 The same day, a memo went out: Do not, under any circumstances, climb on the staircase. It doesn’t support the weight of a human being. As a reminder, a large sign was placed at its foot alongside an orange traffic cone. The sign is now a constant off-air presence. As a design feature, The Staircase provides the illusion of height and depth and symbolizes our goals as a newsroom. Editorially, we strive for depth. Ratings-wise, it’s height. It’s a constant battle, into which our armies of newsfolk — at all TV stations — march each day. As long as they stay off the stairs. This entry was posted in WXIA on February 18, 2013 by live apt fire. I’ve watched your 7p show, most weekdays, for nearly eight years. There have been a lot of changes. Most I do not like, even as short lived as so many of them have been. But I do not understand the new set at all. Least of all, the stairs. It all has the feel of a newscast being conducted in the middle of a warehouse, with florescent overhead lighting, in my opinion. I tried watching again tonight. This set is a train wreck. Dirty floors, crooked floor lamps(?) in the background, vast unused space, atrocious lighting,and just too much visible clutter everywhere. Honestly, its enough to make me not watch. I can’t be the only one. Its just bad, Dougy… and I have yet to see the stairs to nowhere. They need to spend more time having just one technically sound show before painting the rotten fence, in my opinion. No matter how had you try, no matter how hard you work, you’ll never be able to get to the next level. Yep that’s my take on the stairs you can’t use. Why does an anchor have to hold a tablet while reading the news? Is there any practical aspect to it or is it just more technology eye candy? Those lower third information supers are too big. They cover up too much of the picture. Just saying. And get off my lawn, kid! 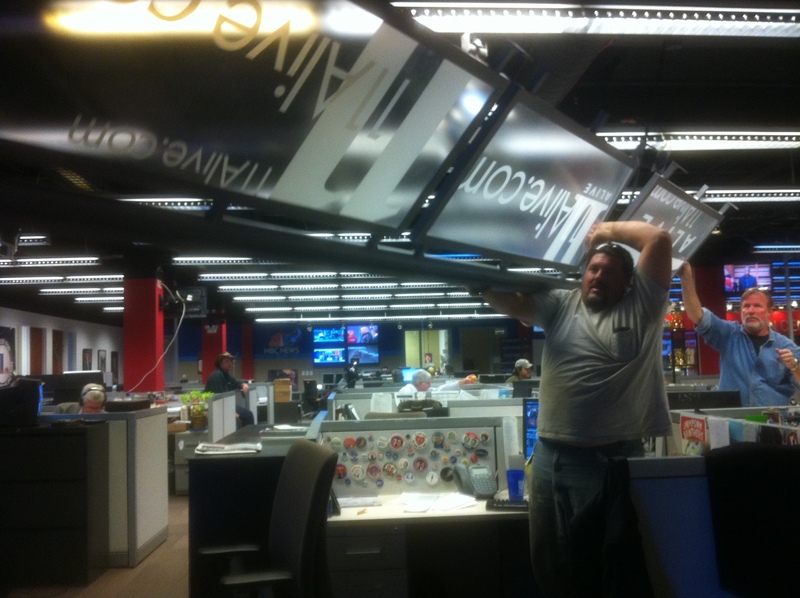 At least it didn’t fall during a newscast. Anyone remember way back in the 70’s when one of the Action News sets was being built, a portion of it crashed during Johnny Beckman’s weather segment? It made a hell of a noise, but Beckman didn’t flinch. He casually looks over and says, “What the hell was that?”. I am told the switchboard lit up with offended viewers. Beckman is still my weather hero. More lipstick for the pig.